INSPIRATIONAL BABY is a series of two new video tapes (and DVDs) presenting positive, life-enriching experiences for infants and toddlers (ages 0 to 3 years). The video tapes are designed to stimulate and enrich a young child's heart, mind, and body, while providing entertaining, engaging experiences. Certain songs contain stories - stories designed to reinforce positive messages for young, growing minds. Many of these "story songs" tell the story of Jesus arriving on Earth to bring peace and love to all of God's children. Songs like "What a Friend We Have in Jesus," or "Amazing Grace," provide the reinforcement kids need to the "good news" stories they are hearing at church or at home. As a child grows, his or her ability to comprehend these stories grows as well. Music and visual images play a big role in helping a child remember stories, supporting early language development. And "story songs" are fun too, because most of them feature "characters," other people (usually children) acting out the stories, helping to communicate the message found in the stories. In this way, the "story songs" also help to prepare children for preschool, focusing on early language arts experiences, as well as music and art. As in all Inspirational Baby videos, the songs and images will reinforce God's love for the child, and the life-affirming messages of the Bible. 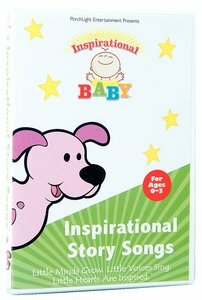 About "Inspirational Baby: Inspirational Story Songs"
:Inspirational Baby is a series of two new video tapes (and DVDs) presenting positive, life-enriching experiences for infants and toddlers (ages 0 to 3 years). The video tapes are designed to stimulate and enrich a young child's heart, mind, and body, while providing entertaining, engaging experiences. Porchlight Entertainment is a multi-faced company focused on the production and distribution of high-quality family entertainment. Since its formation in 1995 by Veteran entertainment executives Bruce D. Johnson and William T. Baumann, Porchlight has produced several feature films including The Trial of Old Drum, Treehouse Hostage, Ground Zero, Wild Grizzly, Night of the Twisters (Family Channel) and Stranger in Town (Showtime), in addition to the award winning animated children's series Adventures From the Book of Virtues airing weekly on PBS, as well as Jay Jay the Jet Plane airing daily on PBS Kids Ready-To-Learn block June 2001.